Hay Probe Bale Sampler for Sampling Hay and Forage Bales. Includes Bagging Attachment. Best for Smaller Square Bales, 18" Depth, 24" Long, 3/8" Shank Fast Shipping! Hay Probe Bale Sampler for Sampling Hay and Forage Bales. Includes Bagging Attachment. Best for Smaller Square Bales, 18" Depth, 24" Long, 1/2" Shank Fast Shipping! Our Most Popular Length for Sampling Hay and Forage. Includes Bagging Attachment. Use with Large Bales. 24" Depth, 30" Long, for 3/8" Drills. Our Most Popular Length for Sampling Hay and Forage. Includes Bagging Attachment. Use with Large Bales. 24" Depth, 30" Long, for 1/2" Drills. Best Harvest Hay Bale/Forage Sampler Probe with Bagging Attachment. Use with Large Bales. 36" Depth, 42" Long for 3/8" Drills Ships USA and Canada Only. Best Harvest Hay Bale/Forage Sampler Probe with Bagging Attachment. Use with Large Bales. 36" Depth, 42" Long for 1/2" Drills Ships USA and Canada Only. 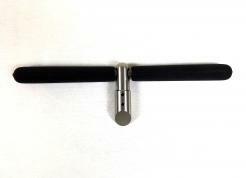 Best Harvest Bale/Balage/Forage Sampler Probe with Stainless Steel Serrated Tip. 11" Cross-bar Comfort Grip Handle Design. Fast Shipping!